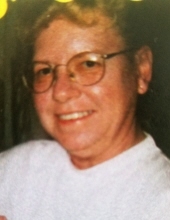 Pamela Kay Rodgers, 71, of Bucyrus, died peacefully with her husband by her side on Wednesday, January 30, 2019 at Altercare of Bucyrus. She had been in failing health. Pam was born February 22, 1947 in Marion, Ohio and was the only child of the late Arnold Lee and Peggy (Hypes) Brookover. In her youth, Pam was an avid roller skater who possessed enough talent that would have allowed her to travel with a skating group, however she chose to stay in school and graduating in 1965 from Marion Harding. Pam married Harold E. Rodgers on December 31, 1999 and together they enjoyed a couple of trips to Las Vegas, played cards on Monday nights at the Elks as well as played cards and other games with family. Pam had a personality that drew you in and she was just a fun person to be around. She enjoyed baking for family and friends and will be specifically remembered for her pineapple upside-down cake. Pam was a member of St. John’s UCC; Elks Lodge and the American Legion Women’s Auxiliary, where she also helped as a bartender. She liked to dine out with friends and for relaxation, she enjoyed a glass of gin, watching old movies and often listened to Barry Manilow. In addition to Harold, her husband of 19 years, Pam is survived by three children, Christie Hallenbeck, Catherine (Richard) Manning and April (Arthur) Payne; six grandchildren, Kyle Mark, David Mark, Christian Bierce, Chase Bierce, Cameran Rodgers and Cory Rodgers; two sisters-in-law, Evelyn (Bo) Shope and Deb (Dave) Higginbotham and two brothers-in-law, Bill (Doug) Rodgers and Charlie (Shirley) Rodgers. She was preceded in death by an aunt, Phyllis Jerew and an uncle, Gene Hypes. Though no public services will be held for Pam, friends are invited to share a memory with one another and offer up a toast. To send flowers or a remembrance gift to the family of Pamela Kay Rodgers, please visit our Tribute Store. "Email Address" would like to share the life celebration of Pamela Kay Rodgers. Click on the "link" to go to share a favorite memory or leave a condolence message for the family.